Belloccio Shimmer Highlighter Blush - Radiant Pearlized Effect for Eyes and Cheeks. A great application with shimmer highlighter can bring out your best features and even provide the illusion of features you’ve always wish you had. Instantly brightens, is long lasting and helpful for keeping skin smooth and flawless. 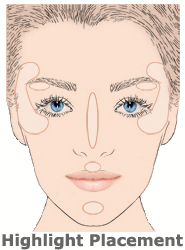 Apply under the eye area and bring up around to the eyebrow this will suddenly make tired eyes look BRIGHT and AWAKE! Apply highlighter under the brow bone to give a pop to the eyebrow. Apply above the bow of the lip to give the illusion of a full plump lips or even counterbalance dark shadows on the face.